At the School of Interactive Arts (SIA), I designed the curriculum materials and some of the branding materials. This is the materials to use for teaching how to make Game Design Documents and to give feedbacks at SIA. I wanted to represents the theme of SIA - making games, and the organization SIA belongs to. As a result, I made some 2D pixel art figures represents the “game” aspect, and use the logo color palette of Urban Arts Partnership, the organization that runs SIA. 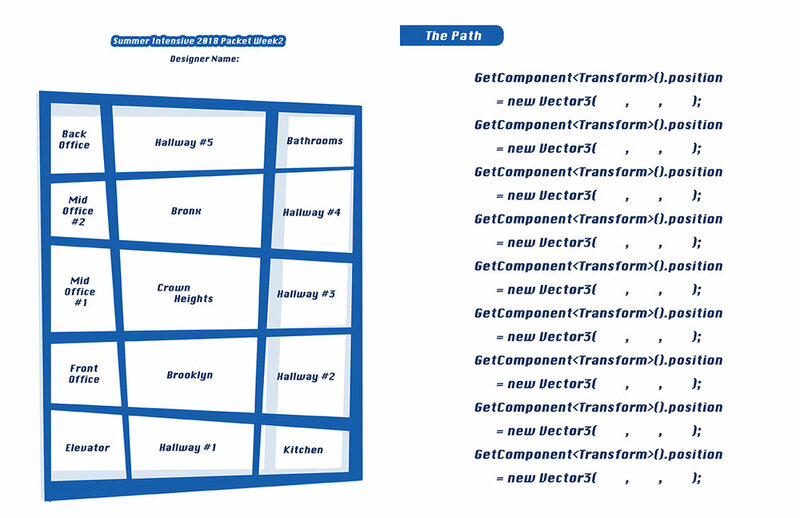 This is a two-sided sheet for a programming exercise. On the left is a map of our office, where the class take place, on the right (back of the sheet) is some code with blanks. The exercise is about filling in the correct code to get to the destination. This is a school version Snakes and Ladders. The exercise is about designing the characters and introduce meaningful choice to the game.